Posted on January 31, 2019 by Peter Kelley. This entry was posted in Engaging Interests and tagged engaging interests. Bookmark the permalink. 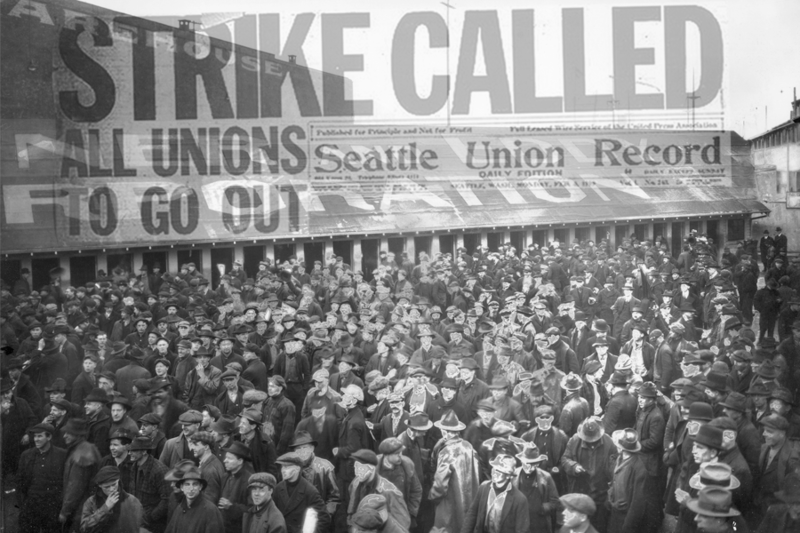 The Labor Archives of Washington will celebrate the 100th anniversary of the 1919 Seattle General Strike with a series of events over the next week, as well as a new library exhibit on campus. There will be book readings, documentary films, a bus tour and live performances and presentations at several locations from Feb. 2 through Feb. 9. The Labor Archives of Washington, housed at the University of Washington curated by archivist Conor Casey, is joined in these events by many partners, including the UW’s Harry Bridges Center for Labor Studies, under the heading of Solidarity Centennial. The still-growing list of related events is online here. Featured in the events is UW history professor James Gregory, who has written a new introduction and afterword — and contributed a photo essay — to the November republication by University of Washington Press of Robert L. Friedheim’s 1964 book, “The Seattle General Strike” in a “centennial edition.” Gregory will read from the book at 6 p.m. Feb. 4 at the University Book Store. This story originally appeared at UW News on January 14, 2019.